CAMP AGUINALDO, Quezon City – The Armed Forces of the Philippines (AFP) awarded cash rewards amounting to P27.6 Million to informants for the vital information they shared that led to the neutralization of ten (10) terrorists in a ceremony held Thursday, 31 May 2018 at the OJ2 Multi-Purpose Hall, ISAFP Compound, here. 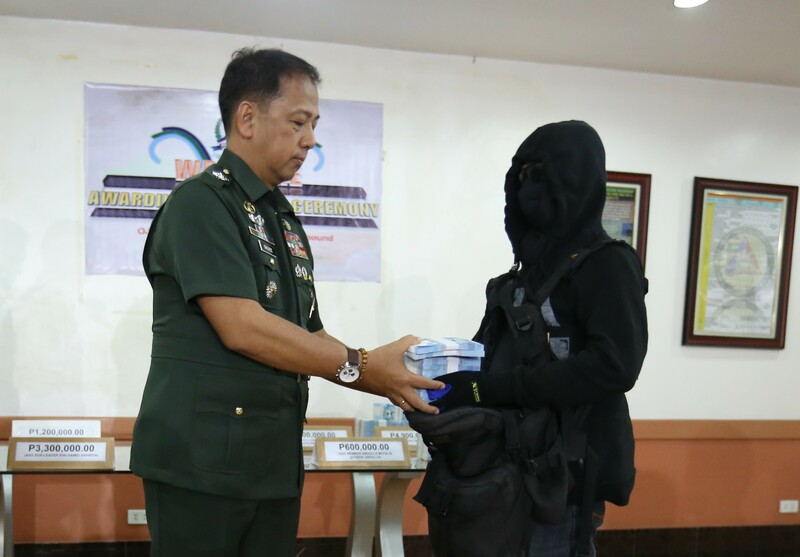 General Carlito Galvez Jr., the AFP Chief of Staff personally handed over the cash rewards to ten (10) individuals whose identities were concealed for their security. Also present in the ceremony was MGen Fernando Trinidad, the Deputy Chief of Staff for Intelligence, J2.